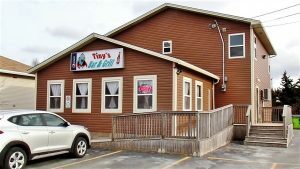 Tiny’s Bar and Grill, except for one or two tables, was full of diners enjoying fish and chips, hot turkey sandwiches and soup. There was lots of chatter and noise from clanking dishes. A couple sat at a table for two. He looked to be in his seventies. She was of similar vintage and well turned out – in a clean, tidy, respectable way, as if they’d just come from church. She wanted a bowl of soup, just soup. Neither of them looked like big eaters. Perhaps she was being frugal. Many seniors need to be. Pea soup was ordered after the server confirmed to the woman that it was available. Tiny’s cheerful, young server then turned to the gentleman. “No, my dear, nothing at all,” he said in a soft voice. “He doesn’t eat in the middle of the day,” said the woman. “Something to drink?” asked the server. “Do you want a pot of tea?” the woman asked gently, kindly. Little was said between them until the food arrived. They were much like myself and spouse in this regard. Sometimes it’s enough just to be together in the moment, especially when your love spans several decades. Their talk picked up when the tea came but it was, and continued to be, mostly one-sided. She ate, with pleasure, as he sipped and, in silence, watched her enjoying every spoonful. What was he thinking? Was he thinking, like me, about the life they’d spent together? About the rough patches they’d come through? Maybe he was thinking about a holiday they’d enjoyed, a special birthday or anniversary, the times they’d laughed till it hurt at each other’s jokes. He may have been thinking on this day – Valentine’s Day – how, despite the hard times, through all of it, their love for each other continues to grow. Around a corner, unseen by the elderly couple but visible to most customers, a large TV screen showed live coverage of the luge event from the PyeongChang 2018 Winter Olympics. Patrons ignored the ice sport coverage. It was lunchtime. They were focused on their food and dining companions. It was icy cold outside. Perhaps, like me, the last thing they wanted to see was ice and snow on TV. Tiny’s Bar and Grill was warm, but I was cold from being outside. A hot chocolate helped revive me as I read Tiny’s menus. Tiny’s dessert menu is a permanent part of the table set-up, along with bottles of white and brown vinegar, sugar, salt, pepper, cutlery wrapped in white paper napkins and a votive candle in a small, short, clear glass vase. Unfortunately, home cooking at Tiny’s does not extend to desserts. All are made by machines in a factory. Tiny’s main menu is long, making the choice of two appetizers and two mains easy. 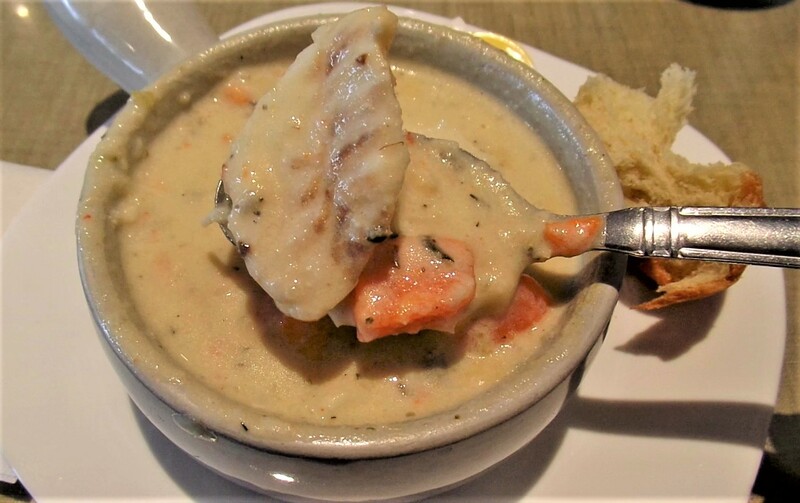 Described as a “seafood selection cooked in its own juices and finished with cream,” Tiny’s seafood chowder was that and more. In addition to chunks of cod and other fish, it contained potato, carrot and herbs. 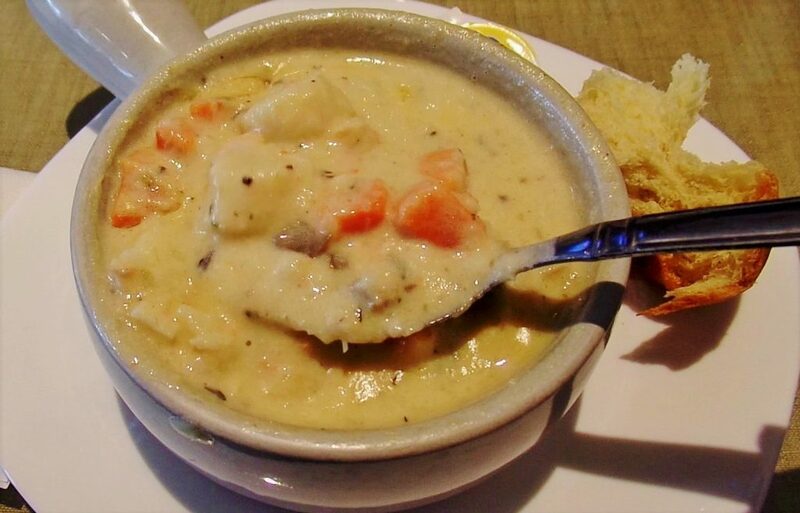 The chowder was made to satisfy and comfort, and in my case it did. 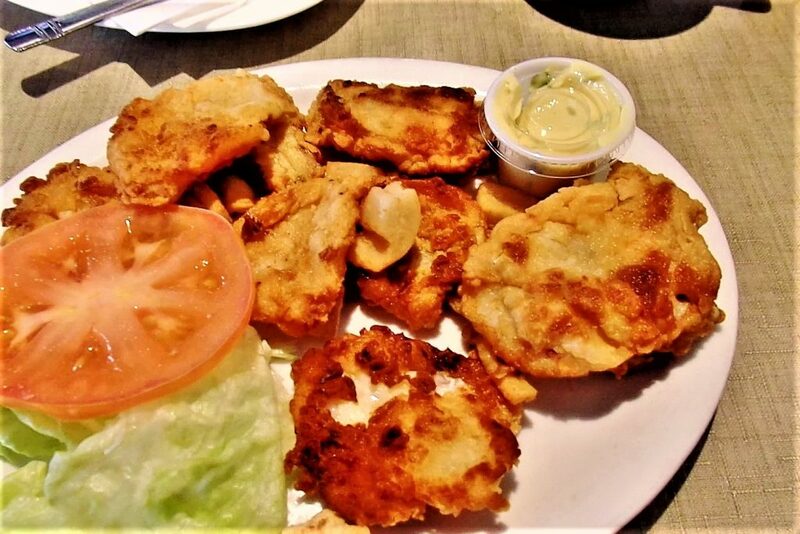 Eight good sized tongues, mingled with equally generous scrunchions, a leaf of lettuce topped with a slice of tomato and a small plastic tub filled with tartar sauce constituted Tiny’s dish of Newfoundland pan-fried cod tongues. Before frying, the tongues had been coated in what was described as “Tiny’s flour mix.” The coating had a slight grittiness about it. Perhaps a little corn meal or something similar had been added. Tiny’s golden tongues and scrunchions were expertly cooked. I enjoyed them. Spouse ordered liver and onions, or, as the menu called it, “Baby Beef Liver.” Baby beef? That would be a calf or young cow. Tiny’s calves liver was good. 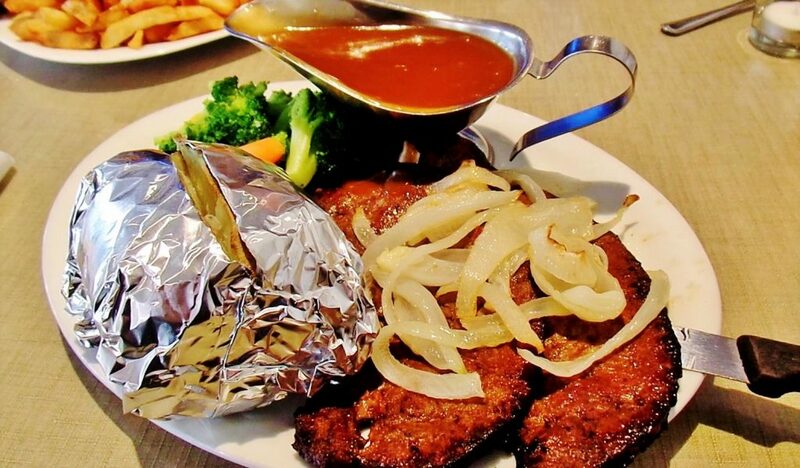 It didn’t give the impression of shoe leather but was cooked enough to suit the palates of most Newfoundlanders, who like liver with some tenderness, but not juicy. It came with broccoli and carrot and choice of potato. Spouse chose baked potato. The potato was tender and nutty, while the vegetables tasted like previously frozen vegetables. A boatload of beef gravy was served on the side. 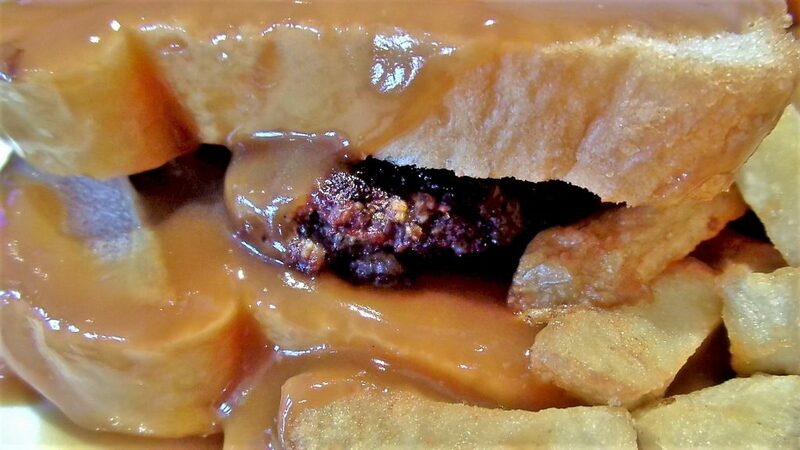 A hot hamburger sandwich with fries, dressing and gravy is the same as a hot turkey sandwich, but with a hamburger patty instead of turkey. I like hamburgers, except when the meat is burned. I don’t mean well-done. I mean burned. This goes for hot hamburger sandwiches too, even when smothered with beef gravy. I was served a dry, burned black patty between two slices of bread. 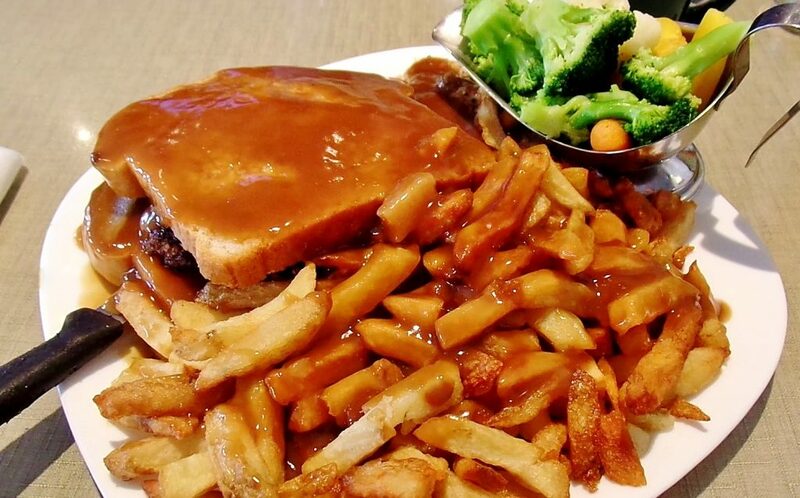 The fries, dressing and gravy, however, tasted exactly right. Sometimes it’s better to stick with the tried and true, a hot turkey sandwich, or pea soup – thick, not watery. 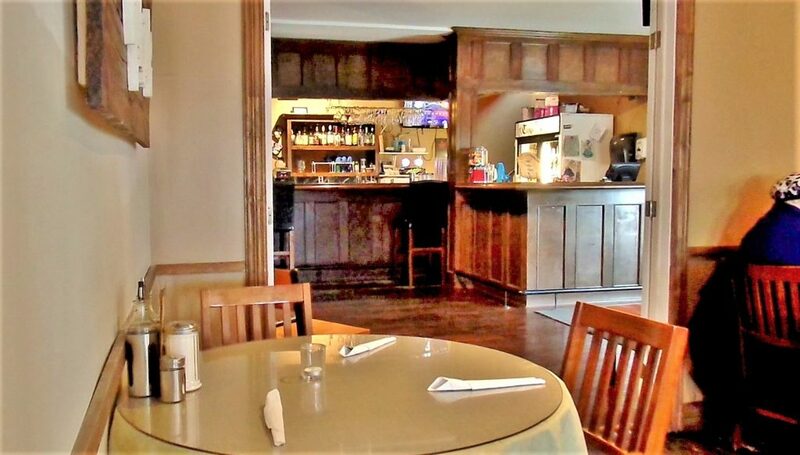 Price Lunch for two with appetizers, tax and tip costs approximately $60. 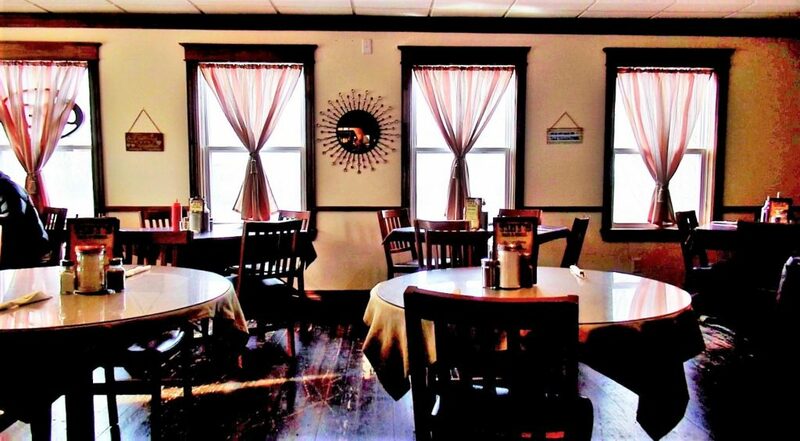 Open Restaurant hours: Monday to Friday from 11 a.m. to 9 p.m. Saturday and Sunday from 8:30 a.m. to 9 p.m. Beverages A selection of domestic and imported beers, spirits and Yellow Tail wine. 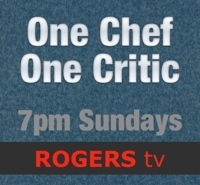 Best bets Seafood chowder, cod tongues, liver and onions. Gluten free options Ask server for details. Vegetarian and vegan options Ask server for details. Wheelchair access Yes. Tiny’s has an outside ramp and fully accessible restrooms.